Parenthood is one of life's most profound, rewarding, and difficult experiences. Becoming a parent isn't much of a problem. In fact, the process is usually, if not always, enjoyable. But nature plays a dirty trick. There are a few minutes of pleasure and profound enjoyment along the way as your child grows and matures. But there are also sleepless nights, endless car pools, disappointments and potential problems at every step of the way. Anthropologist David Guttman spoke of the "chronic emergency of parenthood". 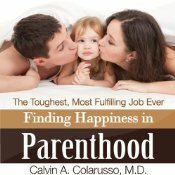 In this book, psychiatrist Calvin A. Colarusso, M.D., father of three and grandfather of six, who has seen it all, traces the experience of parenthood from pregnancy through the stages of childhood and adolescence and through the years of living with adult children and grandchildren. With wit and wisdom, he elaborates on the pleasures and travails of one of life's most profound experiences. This is a book for prospective parents and for parents of any age. Finding Happiness in Parenthood, the Toughest, Most Fulfilling Job Ever provides parents with a roadmap for raising their children, guiding them around potholes, and providing scenic overviews to enhance the pleasure of this most fascinating of life's journeys. Use the strategies in this book to become happy parent of a healthy child.